The Boone Central/Newman Grove Golf Invitational scheduled for Saturday, April 13 has been postponed to Tuesday, April 16 starting at 9:00 am. Due to forecast of inclement weather, Ord Public Schools will be closed on Thursday, April 11th 2019. Ord Golf Invite results:. Team - Varsity 3rd and JV 8th (11). Meyer 2nd and Ries 15th. Congrats! The varsity track meet scheduled for Thursday, April 11 in O'Neill has been postponed to Tuesday, April 16. The meet will begin at 9:30 am on Tuesday. The LouPlatte Conference Quiz Bowl has been rescheduled for Wednesday, April 10 in Doniphan-Trumbull with check in scheduled for 9:00 am. The varsity golf meet scheduled for April 2 in Ord has been postponed to Tuesday, April 9 starting at 10:00 am. Also, the junior varsity golf invite scheduled for Wednesday, April 3 in Grand Island has been postponed to Friday, April 5 starting at 10:00 am. Ord Invitational Golf Meet scheduled for Tuesday April 2nd postponed to Tuesday, April 9th. GINW JV Meet Wednesday moved to Friday the 5th. Come join us tonight for Musicalia at 7:00 PM in the Vintage Gym. Watch the trailer here https://youtu.be/KlTJfHmqlQk. Congratulations to the 18th Street Singers for their third place finish at the NECC show choir competition yesterday in Norfolk!! The Ord Elementary 6th Graders present "Thwacked!" a musical performance. Tuesday, March 26 at 7PM @ The Golden Husk. No admission. Free will donation. Snacks available for purchase. The varsity track meet scheduled for Friday, March 29 in St. Paul has been moved to Thursday, March 28. The start time for the meet will still be 2:00 pm. 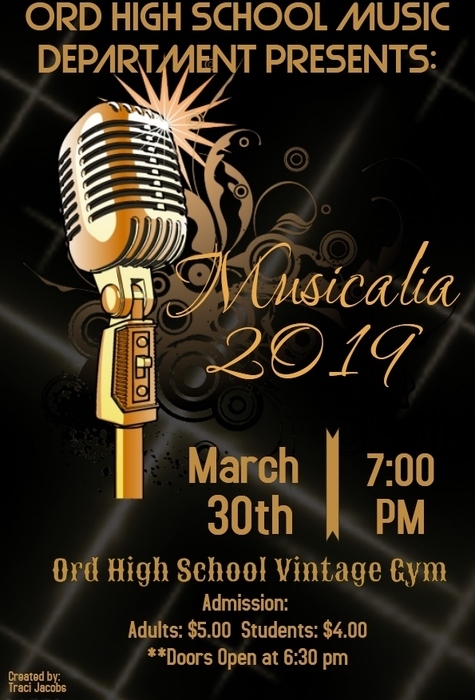 Ord High School Music Department presents Musicalia 2019. 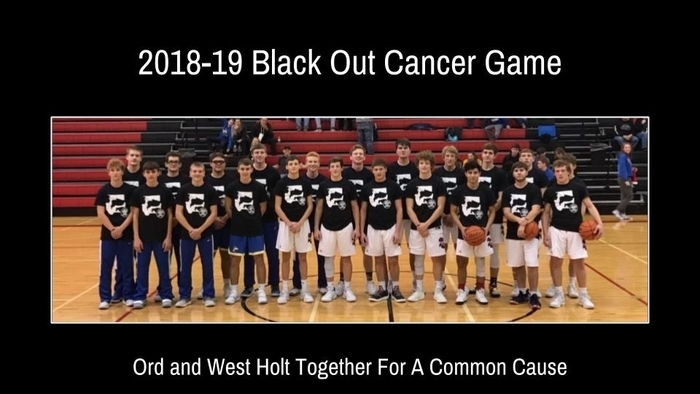 Saturday, March 30th, 2019 - 7:00 PM at OHS Vintage Gym. Catch up with the latest student stories, sports scores, and news updates. It’s everything Ord Schools, in your pocket. Download the app on Android: http://bit.ly/2PtruMk or iPhone: https://apple.co/2GbLOSQ. 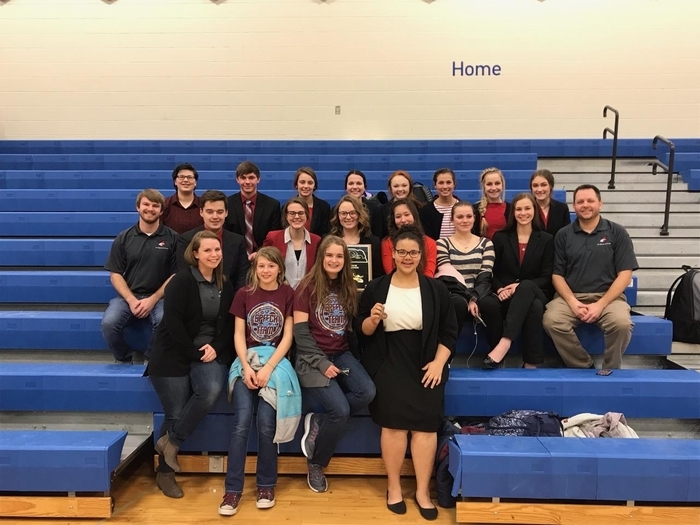 Congratulations to the Ord Speech Team on being Back-to-Back District Champions. Go Chants! The LouPlatte Conference Quiz Bowl scheduled for Monday, March 18 has been postponed to a later date. No date has been set yet. When the new date is set, an announcement will be made. The LouPlatte Conference Art Show and Honor Band clinic scheduled for Saturday, March 16 has been postponed to a later date due to the widespread flooding. When a future date is announced, it will be posted. Due to uncertain road conditions and continued flooding Ord Public Schools will be closed, Friday, March 15th. The C1-5 District Speech meet scheduled for Friday, March 15 in North Platte has been postponed to Saturday, March 16 with the same start time and approximate awards presentation. Due to impending inclement weather, flooding, and impassable road conditions throughout the area, there will be no school on Thursday, March 14th. Be safe Chant Nation! 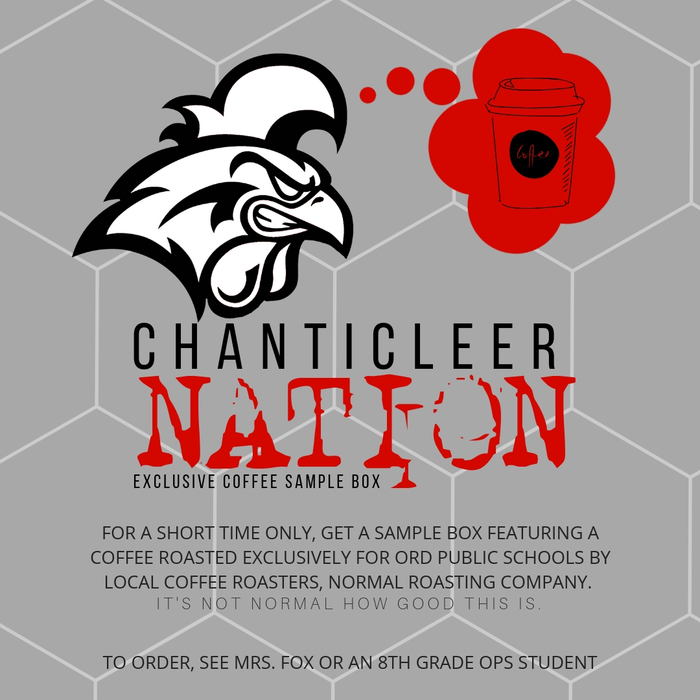 Chanticleer Nation: If you or someone you know is interested in joining the 2019-2020 Ord High School Spirit Squad, please stop by the front office for more information. 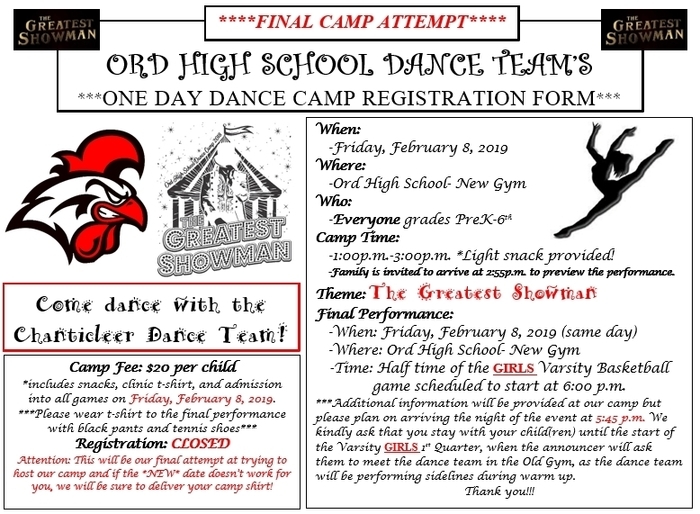 Tryout meetings: Dance--Tuesday, March 19, 2019 @ 6 pm; Cheer--Saturday, April 6, 2019 @ 1 pm. There will be no bussing at dismissal between Elementary and High School. Parents should pick up Elementary students at Elementary school. Due to flooded roads, there will be no bus routes at dismissal times. School will remain in session today. If you make the decision to pick up your student prior to dismissal, please do so at your safest convenience. A correction on the number to call for appointments for the Blood Drive at OHS. The number to call is 728-3241. OHS Scholarship Blood Drive for 9 am to 3 pm today in the wrestling room on the east side of the new gym. Call 728-3244 for appointment. Walk in welcome but appointments have priority. Red Cross experiencing critical shortage...all types needed. The Arcadia-Loup City track meet scheduled for March 21, 2019 has been postponed to Monday, April 8 at 10:00 am. The meet is being moved due to the late winter weather pattern and piles of snow on the track and throwing areas. The speech dual between Ord and Loup City scheduled for tonight, March 7, at 6:30 pm has been canceled. Thursday, March 7th No School due to Winter Weather. Be safe and enjoy an early Spring Break. 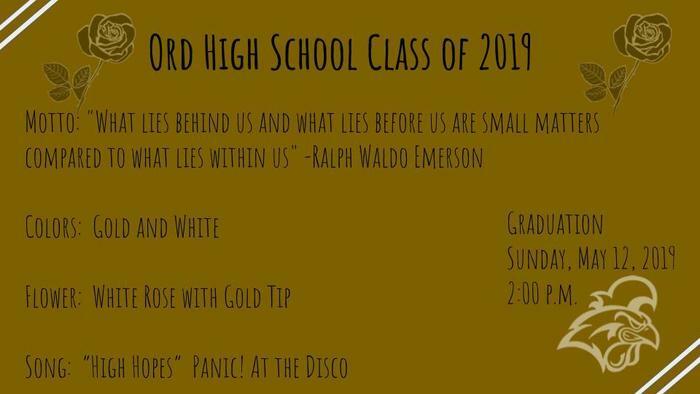 FYI Senior parents: Graduation is around the corner; here in an image of the Class of 2019 themes. If you would like to order track T-Shirts for the upcoming season, you can get an order form from Mr. Trampe or Mrs. Boettcher. Forms with payment must be returned to Mr. Trampe or Mrs. Boettcher no later than 3:30 pm on Friday, March 8. Hear Ye, Hear Ye! 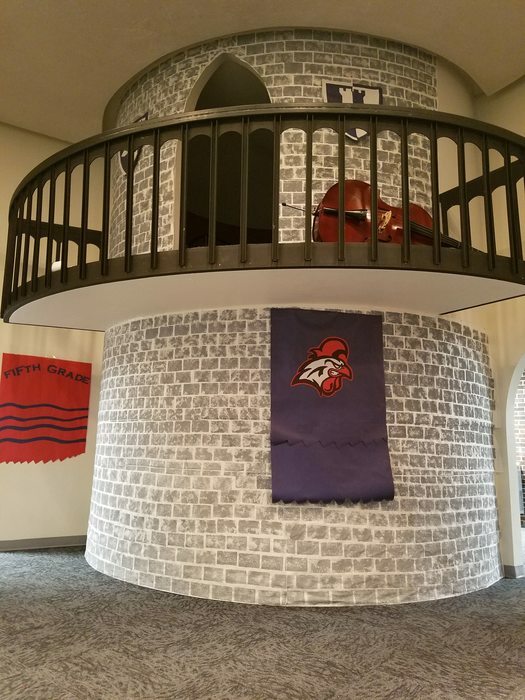 Come see the twist on a classic tale of King Arthur's Court - The 5th Grade Musical - Tuesday, March 5th - 7:00 PM - OES Theater. Students have been working hard to present to you excellence, wonder, and laughter. We hope to see you there! Due to forecasted dangerously cold weather and wind chills tomorrow morning, Ord Public Schools will have a 10:00 Late Start on Monday, March 3rd. 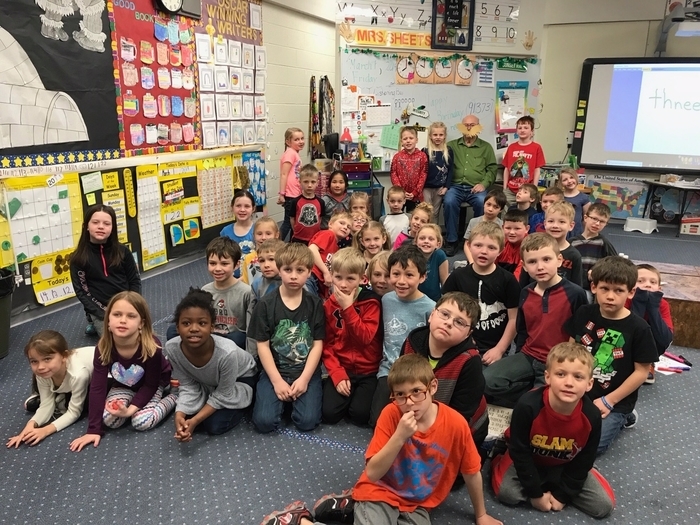 Dr. Karre has volunteered in 1st Grade for 26 years...each of these years he has read The Lorax to the class on Dr. Seuss' Birthday. OES 6th Grade would like to invite the community to attend the wax museum-a night of living history on Tue., Feb. 26 between 7-8 pm in the OES Gym. Figures included: Betsy Ross, Anne Frank, Julius Caesar, & Clara Barton. We hope you can join us for a wonderful evening of history. The Centura Speech meet scheduled for Saturday, February 23 has been postponed to Friday, March 1. The meet will start at 8:00 am on Friday. 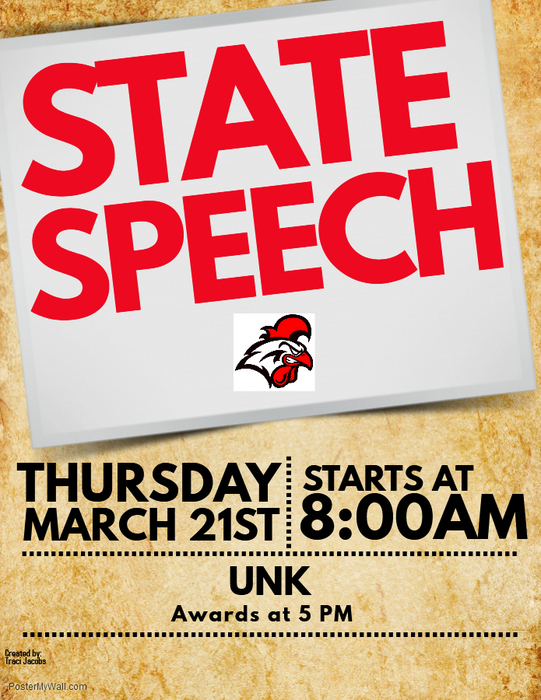 The speech meet scheduled for tomorrow, February 23, has been postponed indefinitely. If or when the meet is rescheduled, information will be posted at that time. Due to winter weather conditions, we will be closed on Wednesday, Feb 20th. Be safe! Broken Bow boys 37, Ord 35. Due to the forecast for snow late Tuesday evening, the C1-10 sub-district basketball games have been moved up 1 hour on Tuesday. The first game will start at 5:00 pm and Ord will play Broken Bow at approximately 6:30 pm. Catch up with the latest student stories, sports scores, and news updates. It’s everything Ord Schools, in your pocket. If you haven’t already, download the app on Android: http://bit.ly/2PtruMk or iPhone: https://apple.co/2GbLOSQ. 10:00 Late Start on Monday, Feb 18th due to snow packed roads and possible drifting snow overnight. Be safe Chants! Results from the state wrestling tournament in Omaha. Jesse Ulrich finishes 5th at 182 pounds to bring home a medal from the state meet. Congratulations Jesse!! Results from NCA State Dance and Cheer in Grand Island. The Ord High Dance Team finished 3rd in both the Pom and High Kick competition in Class C1 today in Grand Island. Congratulations to the dance team!! Ravenna boys 47, Ord 44. 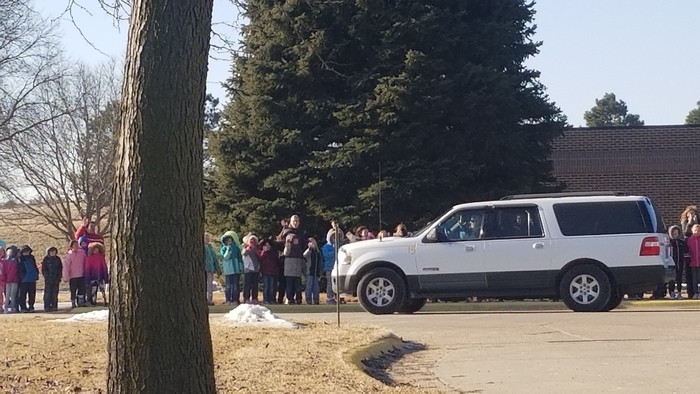 State Wrestling send-off from the elementary students. Good luck wrestlers! Girls basketball team falls to St. Paul 53-52 in Sub-District semifinal. Ord Chanticleer speech team is back-to-back-to-back LPC champions. Congratulations coaches and students. Speech team wins conference again this year!! 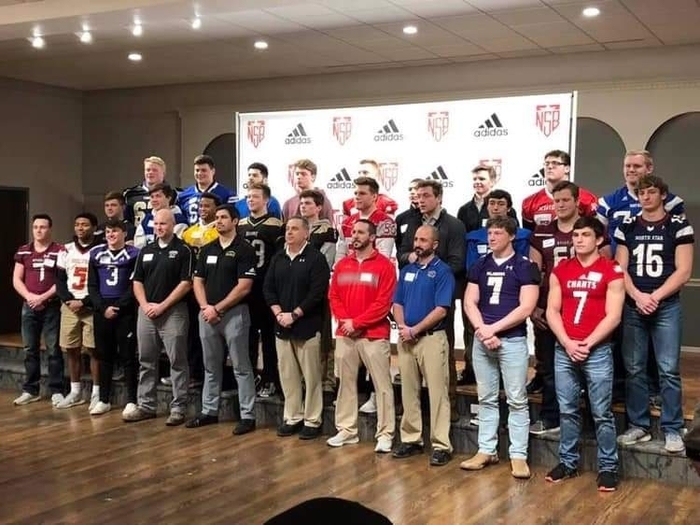 Congratulations to Jesse Ulrich on bring named to 2019 Shrine Bowl! The C1-10 Sub-District games in Greeley have been rescheduled as follows: Bunny Bracket game on Monday 2-11 has been moved to Tuesday 2-12. Semifinal games on 2-11 have been moved to Wednesday 2-13. Game times will remain the same. Ord vs. St. Paul will be Wednesday at 7:30. We are loving our new app! Access sports scores, cafeteria menus, news updates, and even emergency notifications, right from your pocket. Download the app on Android: http://bit.ly/2PtruMk or iPhone: https://apple.co/2GbLOSQ. Ord PS: Due to freezing drizzle/sleet creating hazardous driving conditions throughout the day, school is closed on Monday, Feb 11th. Stay safe! 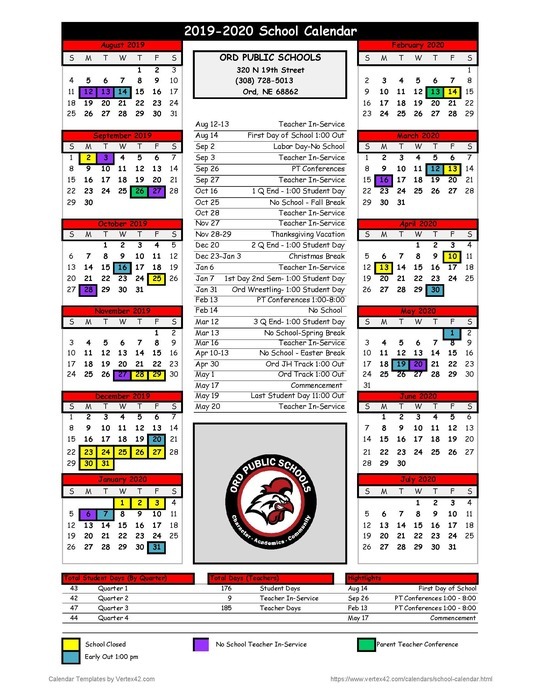 Ord PS: 10:00 Late Start on Monday, Feb 11. We will continue to monitor the weather situation as freezing drizzle is just starting to move in. Just a reminder that orders for state wrestling T-shirts and/or sweatshirts are due by midnight tonight. The link was in an earlier post. Wrestling team finishes third at district meet. Ulrich 1st, Kluthe 2nd, Boyce, Meyer, and Hoevet 3rd. Five wrestlers qualify for state: Kaden Boyce, Garrett Kluthe, Kelan Meyer, Jesse Ulrich, and C. J. However. Finals coming up. Varsity Boys Basketball Score: Ord 48; O'Neill 44. Varsity Girls Basketball Results--O'Neill-70; Ord-48. P-T Conferences - Thursday, February 7th. 4-8 pm. The order deadline for the state wrestling apparel is Sunday, February 10th at Midnight. Ord PS: Due to the forecast of dangerously cold weather/wind chills, there is no school on Thur, Feb 7th. PT Conferences will run as scheduled. Results of varsity boys basketball. Ord-39, Broken Bow-37. Results of girls basketball game: Broken Bow-60, Ord-54. District wrestling start times will be as follows: Friday at 3:00 pm and Saturday at 9:30 am. 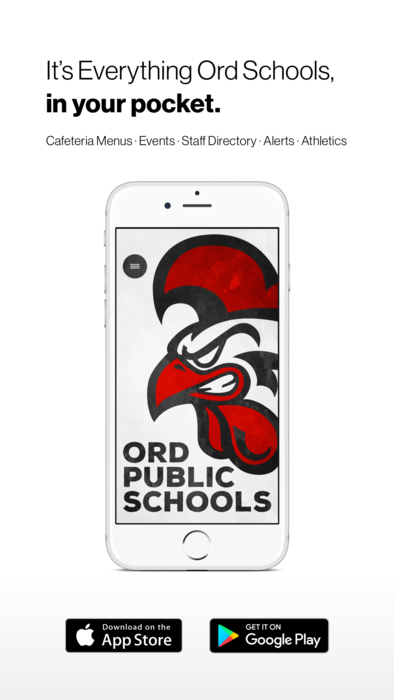 We’re thrilled to announce Ord Public Schools’s new app! 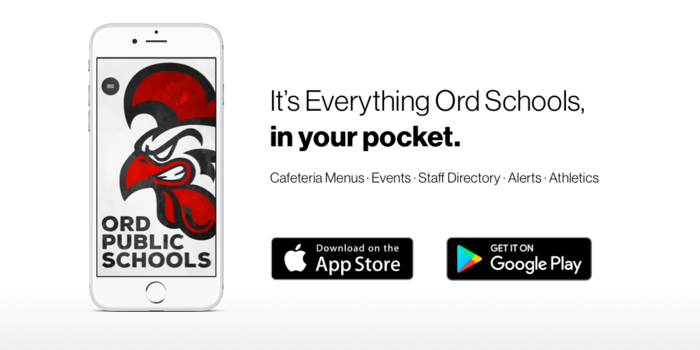 It’s everything Ord Schools, in your pocket. Download the app on Android: http://bit.ly/2PtruMk or iPhone: https://apple.co/2GbLOSQ. Wrestlers finish second at GICC invite with 4 champions and 8 total medal winners. Wood River girls 53 Ord 40. The 9th grade girls basketball tournament at Boone Central on February 9 has been cancelled this year. They will still hold the 9th grade boys tournament on that date. Wrestlers drop duals to Aurora 54-30 and St. Paul 42-34. Doniphan-Trumbull boys 46, Ord 40. Lou-Platte Conf. Tourney. The junior varsity and varsity girls and boys basketball games vs. Boone Central originally scheduled for January 18 have officially been cancelled. Ord boys win first round game in LouPlatte Conference Basketball tournament. Chants defeat ALC 51-34 to advance to semifinals in Central City. The boys will play at 6:00 on Thursday, January 31. Ord boys 51, Arcadia-Loup City 34. Lou-Platte Tourney. Ord Girls win in first round of LouPlatte Conference Tournament. Defeate ALC 62-37 will play in the semifinals on Friday, February 1 at 6:00 in Central City. Ord girls 62, Arcadia-Loup City 37. Lou-Platte tourney. Ord wrestlers 2nd at Ord Invite. The 9th grade boys basketball team will play a game vs. Broken Bow on Tuesday, February 5 at 3:15 pm in Broken Bow. This game will take place before the junior varsity game that day. The 9th grade boys basketball game with Centura has been cancelled. The 9th grade boys basketball game with St. Paul has been moved from February 4th to Monday, February 11 at 6:00 pm. That game will be played in St. Paul. Ord Public Schools will have a 10:00 late start on Wed, Jan 23 due to winter driving conditions. Leave early, go slow, and be safe Chants! The girls and boys basketball games vs. Wood River scheduled for Tuesday, January 22 have been postponed to Friday, January 25. Junior varsity games will start at 4:30 pm. Varsity girls will play at 6:00 pm with the boys to follow. The games will be played in Wood River. The Wrestling dual vs. Wood River scheduled for Tuesday, January 22 has been postponed to Thursday, January 24 at 6:00 pm. The dual will be in Wood River. Due to the current weather conditions and impending weather forecast, Ord Schools will be closed Tuesday, Jan 22. Stay home and be safe! The Freshman Boys Basketball Game scheduled for Monday, January 21 has been cancelled due to the current weather conditions and the forecast for freezing rain. No makeup date has been scheduled. Wrestlers finish 4th at conference meet. 2 champions, 2 runner-ups, and 2 thirds. Kluthe and Ulrich were champions. Due to the weather, the speech meet in Broken Bow will start at 9:00 am on Saturday, Jan. 19. The conference wrestling meet in Wood River will start at 10:00 am on Saturday, Jan. 19. Finally, the little girls dance clinic has been moved to Friday, Feb. 8 from 1:00-3:00 pm. Dance clinic postponed. Details in attached image. Due to the uncertain weather conditions this afternoon and tonight, the games vs. Boone Central have been postponed indefinitely. If a new date is set a notification will be sent out. Due to uncertain weather conditions this afternoon/evening, school will be dismissed at 1 pm today and all evening activities cancelled. For any families that are unable to travel to the school by dismissal, please contact school for arrangements. Due to injuries and the potential for a limited number of matches, the wrestling dual between Broken Bow and Ord scheduled for January 17 has been canceled. Congrats to Chant Wrestlers - Gibbon Invite Champs! Late Night Hoops for Boys and Girls Grades 4-6 is postponed till next Saturday after the Arcadia-Loup City game. Girls and Boys Basketball Holiday Tournament at Bassett will continue on Monday, December 31st. Girls vs. Ainsworth @ 10:00 AM Boys vs. North Central @ 11:30 AM Go Chanticleers!!! The ORD HOLIDAY WRESTLING DUAL TOURNAMENT that was scheduled for Friday, Dec. 28th has been postponed to Saturday, December 29th at 1:00 PM. Basketball Holiday Tournament at Bassett has been postponed to Saturday at 12:00 and 1:30 PM with the Finals on Monday. West Holt boys 51, Ord 49. Final. Ord Elementary Christmas concert tonight at 6:45 @ Ord High School Vintage Gym. Central City Bball games moved to Thursday the 13th. Elementary Xmas Concert moved to December 17th. Also, watch for our new school app!